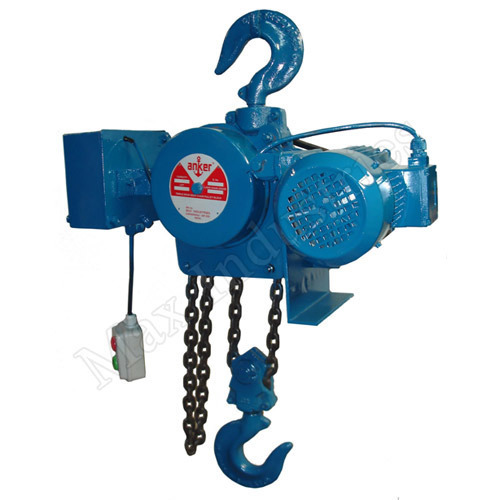 Clients can avail high quality Motorized Chain Pulley Block MH4 Series Hoist from us. These hoists are widely used in the industries like cement, petroleum, still, defence and railways. The offered block is manufactured using finest quality of the raw material that is incorporated into the helical super gear train with no bush system. Clients can avail these hoists from us as per their requisites at market leading prices. Control Panel Unit: Separate & Totally enclosed to protect from weather. Operational Control Station (Push Button Pendant) – suspended from Hoist with a Cable & supporting wire rope operating on only 24 Volts supply. Inaugurated in the year 1986, at Kapad Wanj (Gujarat, India), we, “Max Industries”, are occupied in manufacturing, exporting and supplying a comprehensive assortment of industrial material handling equipment and machinery. Our broad range includes EOT Cranes, Chain Pulley Blocks HH0 Series Block, Manual Chain Hoists, Hand Hoists, Motorized Chain Pulley Block MH2 Series Hoists, Belt-Driven Chain Hoists, Motorized Chain Pulley Block MH6 Series Hoists, Electric Trolleys, Gear Trolleys, Monorail Pull-Push Traveling Trolleys, Gantry Cranes, JIB Cranes etc. These are manufactured using the finest grade raw material and sophisticated technology at our hi-tech manufacturing unit. Keeping in mind the various requirements of patrons, we are offering our wide range of products as per their varied needs. Our offered assortment is widely appreciated among our valuable patrons due to their easy installation, low maintenance, sturdiness, extended durability and corrosion resistance. These are designed with high precision in order to meet the universal quality norms. The offered range is available in various sizes, patterns, shapes and other related specifications as per the variegated needs of patrons. some of our valuable clients from a huge client database are Amul Dairy - Kaira District Co-operative Milk Producers Union Ltd. (Anand),Gujarat State Fertilizer Corporation Ltd. (Baroda),Indian Petrochemicals Corporation Ltd. (IPCL - Baroda),TVS Motors (Chennai) etc.